RGTA® technology and more specifically the ophtalmic device Cacicol20® significantly improve the healing of corneal lesion. Initially, patients have been treated with RGTA® for chronic and persistent injuries in the cornea as documented by numerous clinical cases and on-going studies (for review ). Importantly, over 5000 treated patients were not responsive to conventional therapies and no side effects were caused by the RGTA® application after 5 years of use. Indeed, RGTA® are used to treat neurotrophic keratitis which is a rare degenerative disease affecting the corneal epithelium and associated with impairment of corneal sensation. This disease is characterized by poor corneal healing and the changes in the corneal epithelium range from superficial punctate keratopathy to persistent epithelial defects and ulcers, possibly developing into stromal melting and corneal perforation. It is mostly caused by herpetic keratitis, chemical and physical injuries, topical drug toxicity, irradiation, diabetes and neurosurgical procedures. 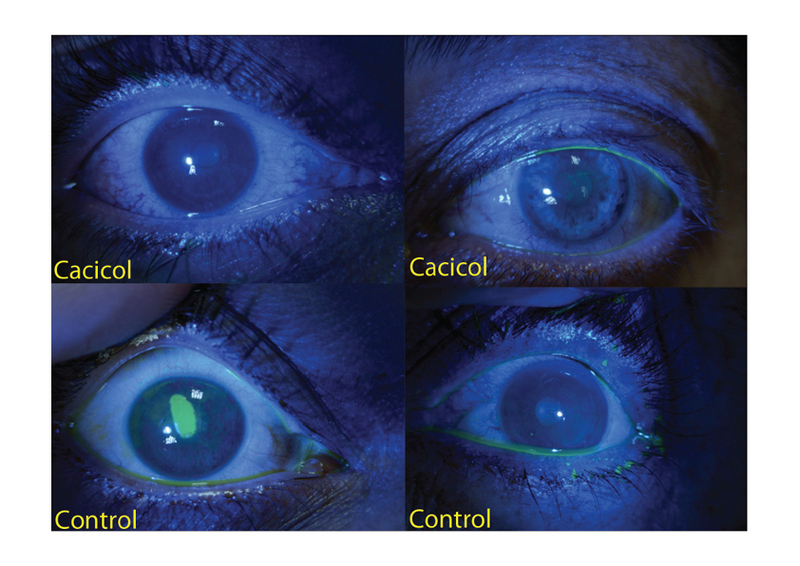 Several studies including a large number of patients suffering from resistant corneal neurotrophic ulcers and keratitis show that application of RGTA® leads to complete healing in approximately 75% of the cases as shown by the successful closure of the neutrotrophic epithelial defects or the decreased ulcer area. No relapse was observed upon the treatment and no side effects were reported [2, 3,4, 5 & 6]. However, response to RGTA® treatment is linked to the access to the extracellular matrix and in many cases these chronic corneal lesions are not easily accessible as they are covered by bacteria and an invisible biofilm. Mecanichal elimination of the biofilm improves the chances of success as shown at ARVO meeting 2017 . The number of cases with positive outcomes is now increasing, extending to association with bandage contact lens , with limbal allograft in advanced limbal deficiency ,with a topical corticosteroid, antibiotics or indication. Such as corneal perforation associated with Sjorgen’s disease [10 & work in progress] and Cogan’s epithelial dystrophy . Furthermore, RGTA® have proven highly effective when combined with other therapeutic techniques. Following treatment with crosslinking agents in keratoconus, application of RGTA resulted in an accelerated cell regeneration and repopularization of stroma thus preventing the massive cellular damage caused by the cross-linking [12, 13]. A first randomized controlled trial was published demonstrating that RGTA treatment was significantly increasing the speed of re-epitheliazisation and healing . Several trials are ongoing. Similarly to patients treated for skins lesions, patients noted significant pain relief associated with RGTA treatment for their corneal injuries underlining the important role of RGTA® in patients quality of life [3, 13]. CACICOL20® is the RGTA®-based product commercialized by OTR3. It improves the quality of corneal eye repair by protecting the matrix microenvironment. Representative results of a study of 60 patients with progressive keratoconus after epi-off accelerated corneal cross-linking. 9- Maringe, E., Gueudry, J., Aifa, A., Delcampe, A., and Muraine, M. (2013). 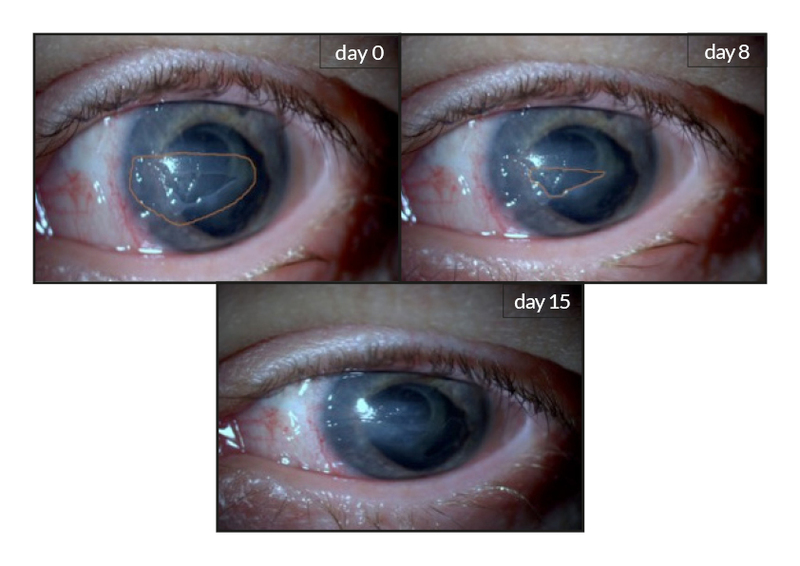 Topical treatment with a new matrix therapy agent (RGTA) in combination with limbal allograft in ocular surface desease and corneal anesthesia. Acta Ophthalmologica 91, 0–0. 10- Renault, D., Lazreg, S., and Abdellah, M.B. (2015) The use of matrix therapy in the treatment of corneal perforation. Invest. Ophthalmol. Vis. Sci. 56(7), 720–720. 11- Labetoulle, M., Rousseau, A., M’Garrech, M., Kaswin, G., Dupas, B., Baudouin, C., et al.(2014). Efficacy of heparin sulfate mimetic polymer in Cogan’s epithelial dystrophy. Invest. Ophthalmol. Vis. Sci. 55(13), 5519–5519.